You wouldn’t think Tom Brady could add much to a resume that was already the greatest in NFL history. But on Sunday, he did. In an amazing game that will go down as one of the best ever, the Kansas City Chiefs and New England Patriots traded late scores and drama, sending the AFC championship game to overtime. It was the second overtime game in AFC championship history, along with the famous “The Drive” game between the Cleveland Browns and Denver Broncos at the end of the 1986 season, and the second overtime game of a memorable NFL conference championship Sunday. Overtime seemed like a perfect setting for Brady. 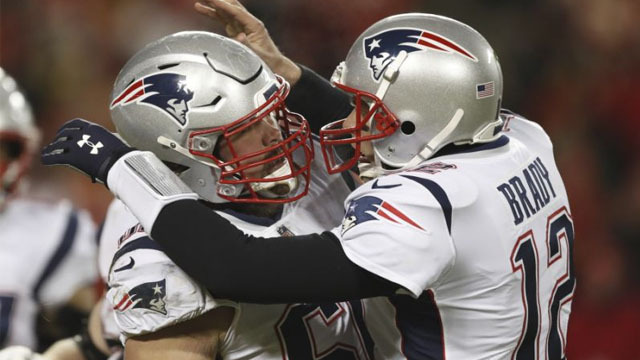 He made three enormous third-down passes to keep the first drive of overtime alive, and Rex Burkhead’s 2-yard touchdown run ended a 37-31 Patriots win. Brady had two all-time clutch drives, one to give the Patriots a lead late in regulation and another in overtime to put the Patriots into Super Bowl LIII against the Los Angeles Rams. Brady and Patrick Mahomes traded huge drives throughout the fourth quarter and then overtime. There were three scores in the last 2:03 of regulation, and two in the last 39 seconds before overtime. Then on the first possession of overtime, Brady made a huge 20-yard throw to Julian Edelman on third-and-10, and a 15-yard pass to Edelman on another third-and-10. On yet another third-and-10, Brady hit Rob Gronkowski for 15 yards on a slant route. That set up Burkhead’s game-winning touchdown. Brady and Bill Belichick, amazingly, are going to their ninth Super Bowl together, chasing their sixth ring. They needed every bit of experience, talent and guile to pull out this AFC championship. The first half was all Patriots. Using the ground game and short passes — where have we seen that before from the Patriots? — New England controlled the flow of the game. Sony Michel scored on a 1-yard touchdown to give the Patriots an early lead. Brady’s 29-yard touchdown pass to Phillip Dorsett late in the first half gave them a 14-0 halftime lead. The Chiefs offense has been one of the biggest stories in the NFL. They hadn’t been shut out in any half all season, until Sunday, according to ESPN Stats and Info. The Chiefs hadn’t even had a scoreless first quarter since Week 12 last season. They also hadn’t been shut out at home in the first half of any of Andy Reid’s first six seasons as head coach, according to ESPN Stats and Info. To say the least, it was a dominant first half, with the Patriots bringing pressure on Mahomes in all different ways. According to NFL Research, the Chiefs ran 16 plays in the first half. The Patriots had 16 first downs before halftime. The Chiefs played better after halftime. They got hot, with Mahomes finally hitting some big plays, and cut the Patriots’ lead to 17-14 in the fourth quarter. But Kansas City still needed a big break. It seemed like they got one with safety Daniel Sorensen’s fourth-down stop on Patriots running back Burkhead’s run on fourth-and-1, but the Chiefs offense went three-and-out. Then it seemed they got one when it looked like Edelman muffed a punt, but amazingly Edelman barely avoided touching it and a Chiefs recovery was overturned after a review of one of the closest calls you’ll ever see. Then, finally, the Chiefs got one. A Brady pass went off Edelman’s hands and versatile safety Sorensen was there for an interception. A return put the Chiefs deep into Patriots territory. Then Mahomes threw a screen pass back across the field to his left, and Damien Williams had an easy path to the end zone for a 23-yard touchdown. That gave Kansas City a 21-17 lead. It seemed possible that would be the score to get Kansas City back to the Super Bowl for the first time since Super Bowl IV. Little did we know at the time, that was just the beginning of the drama. The final half of the fourth quarter and overtime were filled with big plays by both teams. The Patriots just made a few more to get the win. The Patriots scored on a 10-yard touchdown run by Michel on fourth-and-inches to take the lead with 3:32 left. The Chiefs got it back with 3:35 to go and ended up with a Williams touchdown run to go up 28-24. Mahomes had a big pass to Sammy Watkins on that drive, and that seemed like it might be the Chiefs’ signature play in a long-awaited AFC championship. But the game still had three scores to go. In the final two minutes of regulation Brady went on what looked like one of the most memorable drives of his career … one that he would trump a little later in overtime. Brady took the Patriots 65 yards on six plays, with a huge catch by Gronkowski down to the 4-yard line and a Burkhead touchdown run with 39 seconds left. But then Mahomes answered back, with incredible plays to Spencer Ware and Demarcus Robinson that chewed up 48 yards to set up a game-tying field goal and overtime at 31-31. That just set up Brady’s heroics in overtime. The Patriots won the coin toss and Mahomes never saw the ball again, with Brady completing the trio of enormous third-down passes. It was thrilling football by two fantastic teams, including an all-time great quarterback and a young superstar who might be on his way to greatness. In the end, Brady was a little better. He’s not ready to pass the torch yet.